Spartan Blue Climbing Rope Dog Leash with marine grade stainless steel clip or optional carabiner, and swivel. Ideal for medium to extra large dogs. Handmade in USA. 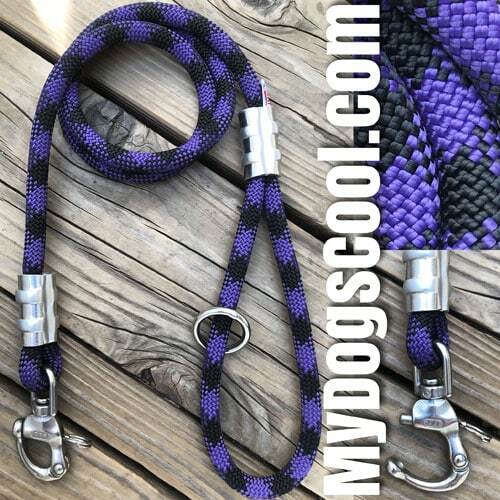 Climbing Rope Dog leashes are a simple design often built with simple materials to maximize profit levels. If you are looking for an inexpensive, or cheap dog leash, you wont find it here. You will find a dog leash built to last by someone that gives a damn about providing customers who understand when I say… “A dogs leash is its life line between you, and harms way”. It takes quality parts, and a hands on approach to build this type of dog leash. Only customers looking for a better than average dog leash to help keep their dogs safe on daily walks, or exploring the backcountry, hiking, running or sports like bikejoring, skijoring and more will understand the need for a quality dog leash. We build among the best climbing rope dog leashes in the USA using climbing rope from USA manufacturers. The hardware is either originally designed for marine applications such as ocean diving, emergency rescue teams, mountain or rock climbing. 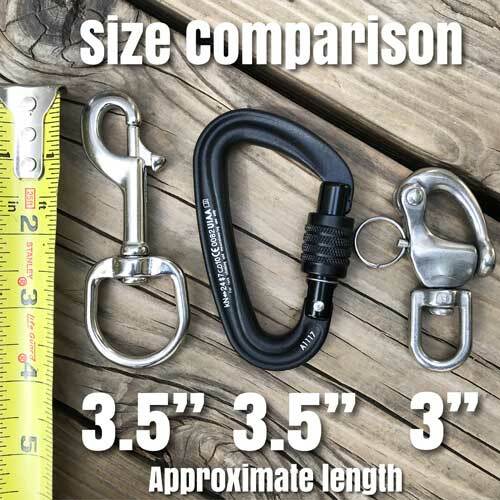 Our choice of 316 stainless steel clips are a better quality than most clips used on inexpensive dog leashes. Our choice of locking carabiners, and CNC machined swivels are professional grade designed for life safety, and climbing applications. 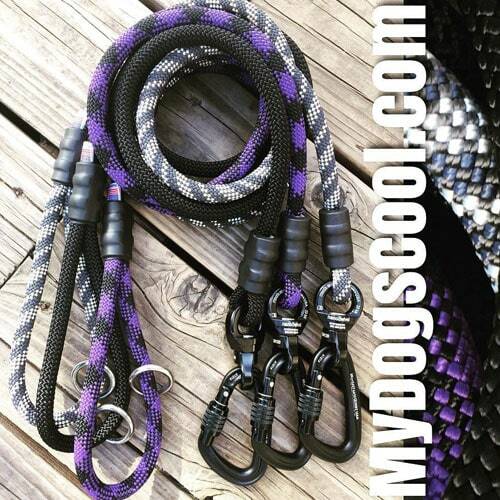 These are exceptionally strong, light weight, and ideal for custom climbing rope dog leashes. The customized aluminium rope connections securing the hardware to each end of the leash or the loop handle are an industrial connection customized by hand. These are frequently being faked by other companies selling knock off leashes. Most medium to extra large dogs can use our standard four foot rope dog leash with stainless steel clip. A six foot leash is ideal for obedience training. The optional carabiner dog leash is perfect for added strength, and safety but does not swivel. Take this into consideration when selecting a leash. 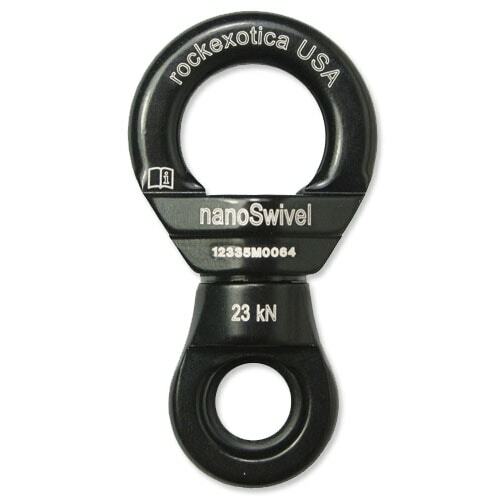 The optional nanoSwivel that works in conjunction with a locking carabiner is a high end CNC machined swivel with a stainless steel axle with sealed bearings. This is the only swivel of its kind manufactured in the USA. Its pricey but worth it for those of us wanting a quality leash for our big dogs that we know will be reliable for years to come. Short dog leashes offer more control, these are typically called traffic leashes, or control leashes. An optional second handle can be added close to the dogs end of the leash for those wanting a single leash with two handles for maximum control. A US Veteran owned business with a passion for dogs. If you would like more information on selecting the best dog leash please check out some of our blog post. The Adjustable Main Grip is intended to assist with a limited or weak grip, it's worn on the wrist.